Well I decided not to knit farther on the Spectra scarf to see if I would like the colors better together once some of the other color changes came into play. I just wasn’t liking the Noro texture in there. 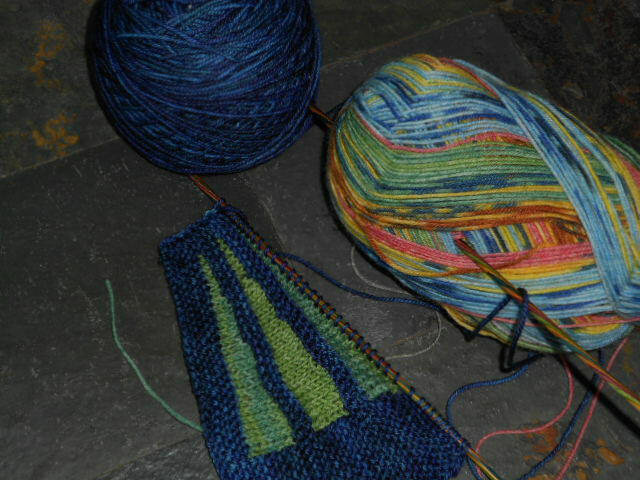 Those two yarns will probably be used together but for a different scarf with two stands at a time so they blend into each other and they’ll look much better because the thicker/thin nature of the Noro won’t matter. I made some of those a couple christmases ago and loved the way they turned out blending a solidy looking and a multicolored sock yarn together. I’m liking these together much better and the color changes will happen more quickly across the wedges. I did head out to WI Craft Market this afternoon and found a new ball winder to replace the one that broke. Well seriously – this can’t be called a “Stashbusting” report because I’m clearly going in the wrong direction! See yesterday’s post and you’ll understand why — fabrics were purchased for Christmas Town Sampler – A Collaboration Among Friends (Judy told me to shop!) so tho I haven’t tallied it all to the exact fat quarter, I’m pretty sure I’m in the red again. Even the yard and a half I used from the stash for the backing and binding of a wallhanging won’t alter that fact. That’s just the way it goes some days. Spent the morning kniting on the Spectra scarf but I’m thinking I may start over with some other yarn (since there’s plenty here to choose from) ;-). I’m just not thrilled with the Noro I picked for the wedge colors – I’d like something a little bright and that changes color more often and I just realized one of the colors in the Noro is going to be way too close to the main color so when I get to that section, the wedge won’t really show. 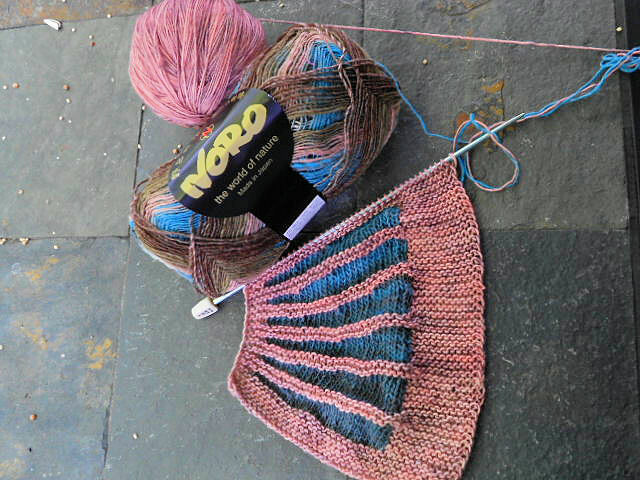 But the biggest thing is the texture of the Noro – it’s slubby (or what I call slubby) with thicker and thinner places. In some things I don’t mind that but in this I’m not real fond of the look. So I may go back to the drawing board or I may knit a bit more till the colors start shifting more and see what I like – I’m undecided.